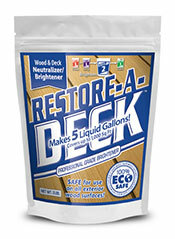 Restore-a-Deck Wood Stains can be applied to damp or dry wood but is best applied to damp wood. Easier and will avoid potential Hot Sun Application Issues. Before you start your wood stain project, ensure your temperature conditions are optimal for best results. The air temperature should be between 45 degrees F and 90 degrees F. Check the weather forecast and do not start the staining process if the temperature is expected to drop below 45 degrees or if rain is a possibility in the next 12 hours. 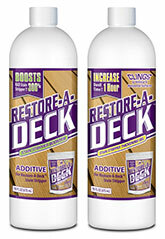 If applying the Restore-A-Deck Wood Stain in full sun we suggest that you apply to a damp deck. Either 1-2 hours after prep or if the wood is already dry, lightly mist the deck with water prior to applying. Make sure all standing water/puddles are gone before applying the RAD stain. 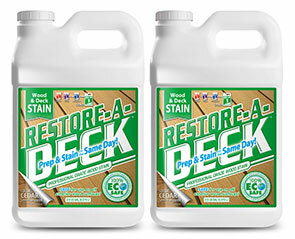 We are pleased to announce two new additives for the Top-Selling and Top-Rated Restore-A-Deck Stain Stripper! 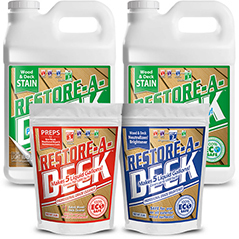 Note: For best results, use the Restore-A-Deck Stain Stripper Booster Additive in conjunction with Restore-A-Deck Thickening Gel. 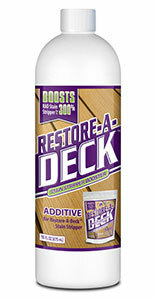 This product works as a Booster additive for the Restore-A-Deck Stain Stripper. 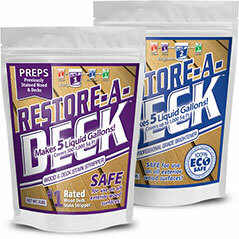 For even better results, use the Restore-A-Deck Stain Stripper Thickening Gel in conjunction with the Restore-A-Deck Stripper Booster. The Thickening Gel adds the ability to cling to vertical and horizontal surfaces for up to 1 hour. If you have any questions on these two additives, please ask below in our comment area. 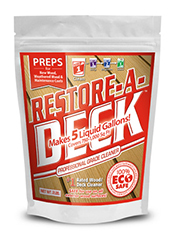 All Restore-A-Deck Prep and Restore-A-Deck Wood Stain must be purchased first from this online eCommerce site (Restore-A-Deck.com) between January 1st - September 5th, 2019. The Restore-A-Deck 3-Step Process must be used. Deadline for entry is September 15th, 2019. The winners will be decided by September 30th, 2019 by our team. We understand that everyone needs help with their wood/deck restoration and that not all projects are the same. Different species of wood, the age of wood, and types and brands of previous coatings make it difficult for homeowners to determine what is needed to restore their exterior wood or deck correctly. We will ask some specific questions and reply to what you will need to do in your restoration process and the appropriate products and amounts to purchase, so it receives the proper prep and treatment required. -Homes: Do each side Lenght x Height, then add up all sides. *Must Include 1-3 Photos of Restoration Project. There is a link to upload photos in the bottom right corner of the comment area. The RAD Wood Restoration Contest is closed! First Place = $500 + 5 Gallon Pail of RAD Stain of your choice! Second Place = $250 + 2.5 Gallons of RAD Stain of your choice! 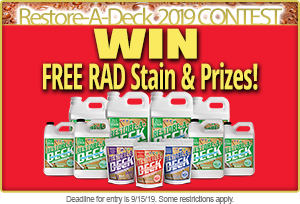 Third Place = $100 + 1 Gallon of RAD Stain or 1 RAD Prep Kit of your choice! Thanks to all the entered this year! 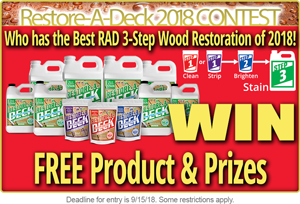 All Restore-A-Deck Prep and Restore-A-Deck Wood Stain must be purchased first from this online eCommerce site (Restore-A-Deck.com) between January 1st - September 5th, 2018. Deadline for entry is September 15th, 2018. The winners will be decided on September 30th by our team. 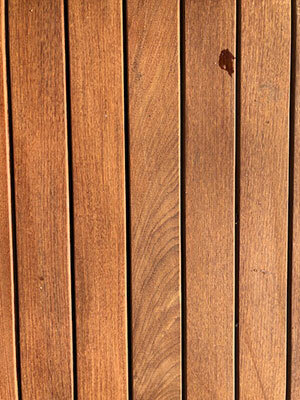 Note: The RAD stain can be applied to damp or dry wood but is best applied to damp wood. Easier and will avoid potential Hot Sun Application Issues. 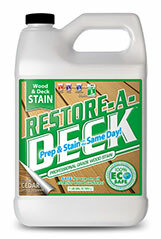 Today we will outline some things you need to know about how to apply Restore-A-Deck Wood Stain to damp wood for best results. Recent advancements in wood stain technology have allowed for a number of benefits, including better UV protection against the sun’s rays, excellent penetration into the wood grain for long-lasting results, and the ability to apply the stain to damp wood the same day as completing the prep steps. Since staining damp wood may be a new concept to some of you, as it has not been a possibility before, we have some tips and things to take into account so you can achieve the best-finished product.